I made a pizza using the pizza dough recipe from The Pioneer Woman (except with half whole wheat flour). 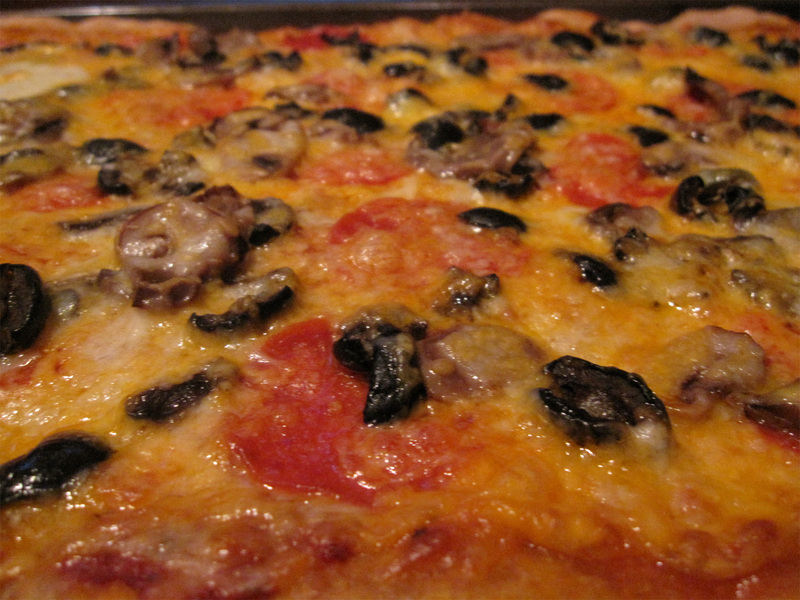 I'm not too fancy about our toppings: canned pizza sauce, pepperoni, cheese, black olives and mushrooms (I could pass on the mushrooms, but I'm an adult, so I'll swallow them and put on a smile). As I was preparing the layers of my pizza, I was thinking about where the cheese belongs in the scheme of pizza. On top of the sauce, but under the other toppings? The final layer of cheesy gooey happiness, atop all the rest of the toppings? Or perhaps a combination of both - cheese on the bottom, and on the top? I opted for both. I started out thinking I would just put the cheese on the bottom, but once I had the rest of the toppings on, I wondered: what would keep those toppings in place? Nothing. There was no glue. I added an additional sprinkling of cheese for good measure. And now, like the force, like duct tape, it binds the universe together. Where do you think the cheese belongs in a pizza?